In 2014, the Birkbeck Sports Business Centre conducted a ground breaking research study into how to best combat the problem of match-fixing in football in Europe, as part of a wider European Commission project entitled Don’t Fix It! ; this formed part of the Commission’s Sport Unit’s 2012 Preparatory Action – a series of complementary projects focusing on the prevention of match-fixing episodes through the education of, and information provision by, relevant stakeholders, such as athletes, referees, match officials and sports administrators. Led by FIFPro, the world union for professional football players, and supported by UEFA, the governing body of European football, the Birkbeck study surveyed over 1,500 current professional footballers in 9 European countries in order to better understand their knowledge, attitudes and beliefs in respect to match-fixing. The research findings were disseminated through a formal report on the survey’s findings, and through a good practice guide on how to combat match-fixing entitled Protect our Game. In this Birkbeck Sports Business Seminar, the Birkbeck Don’t Fix It! lead researcher, Dr Andy Harvey will discuss the project’s research outcomes and detail the key lessons of the project, notably the advocacy of an innovative approach to combating match-fixing, one that aims to influence behaviour in a positive (as opposed to a punitive “after-the-fact” way) in order to ensure that football can confront the threat of match-fixing through mechanisms that are consistent with current best practice knowledge from behavioural science. The seminar will commence with a screening of an interview with Andy Harvey by Birkbeck journalism student Caterina Mirra in February 2015 where Andy summarises the conclusions of the Don’t Fix It research. Since completing the research project Andy has discussed its conclusions and implications in an article published in the Journal of Philosophy of Sport in May 2015 entitled Match-Fixing: Working Toward an Ethical Framework where he argues that the fight against match-fixing needs to be placed on firm ethical foundations. Separately, in a contribution (with Mr Haim Levi) on match-fixing in the forthcoming book Contemporary Issues in Sport Management (to be published later this year by SAGE) he describes the diversity of situations in which match-fixing takes place and the variety of measures available to tackle the problem. Andy Harvey firmly believes that a multi-disciplinary and nuanced approach needs to be taken that accounts for the complexity of individual, socio-cultural, political and economic contexts in which the phenomenon of match-fixing is found. In other words, a ‘one-size-fits-all’ economic approach is doomed to failure, as are approaches based primarily on existing models of law enforcement. In this seminar, Andy will be joined in a round-table discussion at the seminar by two leading practitioners in the fight against match-fixing; Tony Higgins, Vice-President of FIFPro (European Division), and Kevin Carpenter, an internationally recognised sports’ lawyer who specialises in the law as it applies to corruption in sport. Professional footballers are the most vulnerable link in the match-fixing web of corruption, being a necessary target for corrupters and often suffering harsh penalties from governing bodies and the courts for any infraction of the rules. FIFPro has taken a lead role in helping to protect players from the threat posed by fixers, and to help to educate them to make the best choices for themselves and the game. Tony Higgins will discuss the ongoing work of FIFPro to help stamp out match-fixing from the perspective of the people who matter the most – the players. Kevin Carpenter has advised and worked with a variety of bodies on match-fixing issues including INTERPOL/FIFA and the Football Association of Wales, and has written numerous articles on match-fixing and is a regular speaker at conferences and workshops. He is a renowned expert on legal approaches to tackle corruption in sport including recent measures adopted by the Council of Europe. Kevin will discuss the latest legal initiatives and the role of the law in the fight against match-fixing. Kevin Carpenter, Independent Legal & Sports Consultant. Andrew Harvey, Visiting Research Fellow, Birkbeck Sport Business Centre. Tony Higgins, Vice-President, FIFPro (European Division). Carpenter, K. (May 2015). Articles on legal approaches to match-fixing on LawInSport website. Carpenter, K. (9 April 2015). “Why are countries taking so long to act on match-fixing?”. Transparency International Corruption In Sport Initiative blog. Carpenter, K. (December 2014 – January 2015). “Match-Fixing – Framing the Fight Back”. International Centre For Sport Security Journal. Vol. 2, No. 4, pages 62 – 79. Carpenter, K (2012). “Match-Fixing – The Biggest Threat to Sport in the 21st Century?”. International Sport Law Review. Issue 2, pages 13 -24. Harvey, A. (May 2015). “Match-Fixing: Working Toward an Ethical Framework”. Journal of the Philosophy of Sport. Harvey, A. (June 2014). 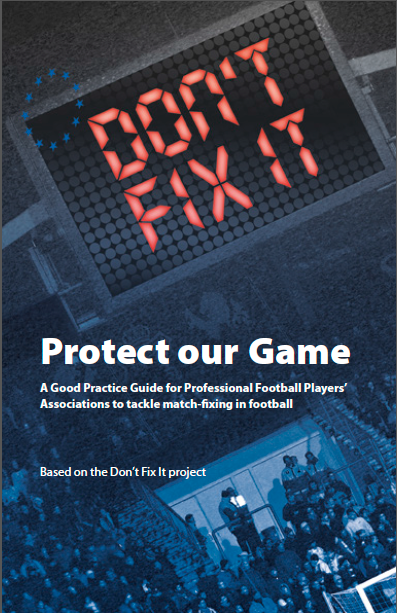 Don’t Fix It: Protect our Game: A Good Practice Guide for Professional Football Players’ Associations to tackle match-fixing in football. Birkbeck College, FIFPro, UEFA, European Commission. Harvey, A. (June 2014). Don’t Fix It: Players Questionnaire – Results and Analysis. Birkbeck College, FIFPro, UEFA, European Commission. FIFPro (May 2015). Don’t Fix It. FIFPro. – FIFPro media communications on anti-match-fixing strategies and activities.